In Clear Your Clutter with Feng Shui, author Karen Kingston says that clutter affects a person in variety of ways. I've been examining these effects as I've pursued Project Empty, and almost all of them have been operating in my life--far more than I realized. I seem to have escaped Number 12, excess baggage--by which Kingston means that people who clutter at home have a hard time packing lightly for travel--because I've always traveled light as a matter of obsessive control. And number 14, cleaning around the crap, never troubled me because, well...heh. Otherwise, yes, every one of those effects of clutter has been present in my life. And it's never been more obvious than now, as the clutter slowly disappears. My living room is 75% cleared, and damned if I don't feel brighter. Livelier. Much more hospitable. The conversations that take place here seem more focused. People like to come here. When I get up in the morning and come out into this room, I smile. But far from wanting to just sit here like a lump, I've been much more likely to jump up, do some chores, run out for something. Far more likely to go wash all my dishes. Fix a meal. Invite someone over. Go to bed earlier. It's almost as if moving through the room is pleasurable. I expect to keep examining these effects of clutter as I continue to clear mine. Overall progress so far: 17 areas cleared. 49 to go. And in the world of getting rid of things: Look, Ma! No shelves! Got the idea and instructions here. I'm going to need to use that "book" shelf idea one of these days. It's fantastic. I've had them up for about 24 hours and already they've garnered amazed and delighted comments from everyone who's spotted them. They go unnoticed at first, then people sit down, look, blink, and go, "Oh, those are so cool!" Cost per shelf? About three bucks, plus whatever you might spend on the worthless used hardcover you elect to desecrate for the purpose. Fun and easy to make. I plan several more. I want the look of a single stack of books from floor to ceiling. Also? 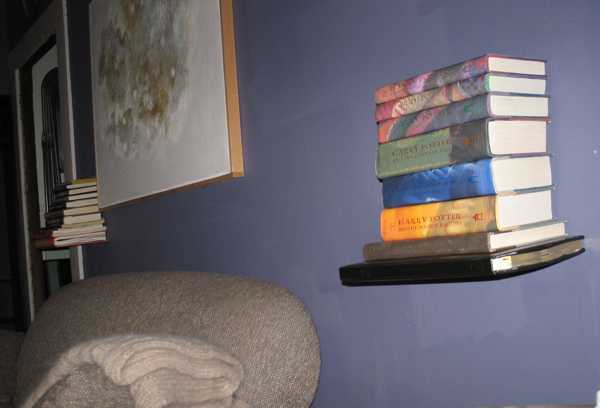 My librarian mom says that flat is actually the preferred way to store good books. Not that I have many of those! I'm a firm believer in how much one's surroundings can affect mindset. I really wish I enjoyed cleaning more, just for that reason. God, I hate cleaning! I really do. Even as I clear my clutter a little tiny dab at a time, I hate the part where I actually have to clean the empty space that's left. So I sympathize. But I'll say this: it's a lot easier to clean an empty floor than one with a ton of crap on it. What a revelation! Glad you like it! The book it comes from is very good. Knife oil is one of those clutter-drawer things, isn't it? I have this vision of weeding, clearing, cleaning, moving around the house in ever-tightening circles, pitching stuff out, organizing...until there's just this one little clutter drawer left in the middle, containing the stuff I can't quite figure out what to do with. Most married women I know say that it's the man who's the pack-rat. I do have the advantage of all my de-cluttering decisions being unilateral. The image of clutter as wildlife and my house as natural habitat being destroyed is kind of delightfully horrific. i can see quite a lot of the items listed do relate to me... i'm gearing up to start cleaning. my best friend just moved out (well, most of her stuff this weekend) and in the process we had to go to the attic so she could get her stuff and OMG i have so much crap in the attic, it's sickening. i did get a look at quite a few things i need to get rid of and so many things i want to keep but have no real use for. i think that's my biggest problem. The feng shui author I mentioned said something in her book that really struck me: even if a mess of clutter is unseen (behind cupboard doors, in an attic, etc.) it still has the effects she lists. The old Fibber McGee's Closet effect. I'm giving that a lot of thought as I go through this project. And I have to tell you: there's something very taboo and kind of empowering about cutting, drilling, and gluing in a book!